Heat water, butter, sugar, cardamom and saffron in a small saucepan over low heat until the butter has melted and the water is lukewarm (not over 40C; you should still be able to easily hold a finger in it). Pour the warm liquid into a mixing bowl and add the egg and yeast. Stir to combine. Add the flour little by little along with the salt and knead the dough for 7-10 minutes until smooth and supple, either by hand or in a standing mixer with the dough hook attachment. Heat the oven to 210C (190C fan) and line a couple of baking sheets with paper. Tip the dough onto a floured surface and cut into 10 portions. Shape each portion into a boule, or the traditional S-shape, taking care not to press out all the air. 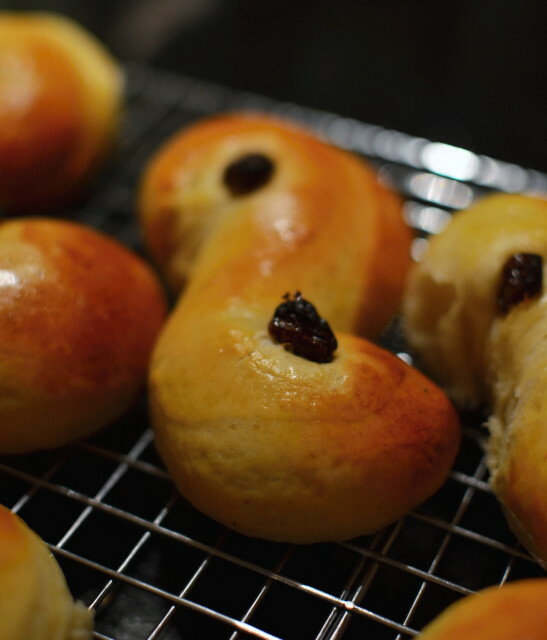 Place on the lined baking sheets, brush the tops with egg wash and decorate with currants. Leave to prove for 30 minutes until risen again. Bake the buns for 15-20 minutes until golden. Let them cool for 10 minutes before serving warm. Read more about saffron here and here.